You can order books the world over!/whatever your location! Mr. Ver committed himself to the world of the bitcoin crypto currency from its early stages. This was several years earlier than conventional venture capital companies began to show an interest in this industry, and he was the first in the world to invest in bitcoin and other crypto currency fintech related startups. Currently Mr. Ver is a shareholder in Bitcoin.com, the comprehensive bitcoin company that is also doing mining, Blockchain.com, a major wallet, Bitpay.com, involved in wallet and card payment, and the Kraken.com exchange. In his spare time he participates in Brazilian jujitsu competitions. 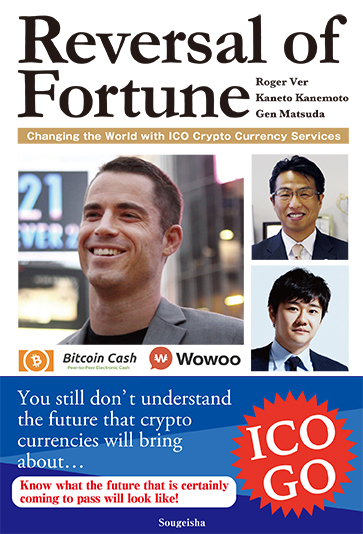 President and CEO of OKWave, one of the largest Q&A social communities in Japan. OKWave’s vision is to facilitate user mutual support through the community. The company runs subscription service for celebrity Q&A’s, and provides enterprise customer support solutions, with the largest share of the Japan market. OKWave has been listed on the Nagoya Centrex Market (3808 Nagoya) since June 2006. Mr. Kanemoto received a bachelor’s degree from Aichi Prefectural University of Fine Arts and Music. [Concurrently] Board Member, bread (Zurich, Switzerland, provider of Breadwallet). Auditor, Nikkei Inc. Japan Association for World Programme. Businessman and investor. Domiciled in Nagasaki City, Nagasaki Prefecture, and born in Kamakura City, Kanagawa Prefecture, on 11 February 1984. Graduated from the Faculty of Commerce, Waseda University. Founded his first student venture while at university. During the same period implemented incubations at a number of venture companies. In February 2006, before graduating, founded As Company. Established As Group Holdings (now Az Holdings) in 2012, and was appointed president (current position). In August 2016, took office as president of Sougeisha (current position). In September 2017, took office as director of OKWave (current position). Signed a partnership agreement with Miyaki Town, Miyaki County, Saga Prefecture, for regional development business, and is working as president of Miyakimachi Co., Ltd. (current position). In December 2017, took office as CEO of OKfinc Ltd. (current position). Responsible for support of business development and technical development at Wowoo Pte., of which he is an investor. Has held position of lecturer on the themes of business, communication, and business startup at Musashino Gakuin University, Kyushu University, and Waseda University. On 24 February 2016, stated his opinion on the financial policy of the Bank of Japan, as the youngest speaker at a public hearing for the House of Representatives Budget Committee.